So you know that idea I was talking about that my roommate Corina and I came up with? You're looking at it! I've always felt a bit narcissistic posting outfits of just me. I mean, it's my blog, and I certainly enjoy documenting what I wear. However, there are many times when I've created outfits for my friends and enjoyed watching them get all dressed up and feel beautiful and confident in what I put together for them. So when Corina hesitantly asked me if I'd do the same for her, a lightbulb went off. Why not make this a regular feature? It'll be called Roommate Remix, and we can showcase outfits I've put together for her. It just takes a fresh eye and some creativity for a person to see their closet in a new light! Corina's got this bubbly, childlike attitude that meshes well with her inclinations towards bright colors and hippie-esque clothing. So for this outfit, I tried to match that with a colorful, bohemian style that fits her personality. Some contrasting brights with her pretty yellow dress and pink belt made the perfect backdrop for some boho-themed gladiators, print bag, and wooden earrings! For my look, I went with a darker, more grungy style for the day. This houndtooth print skirt (or "dog's bite" as Corina likes to call it) is going to get a lot of use in the upcoming fall! For now, I kept it simple with black and white pieces and used my cobalt blue boots for a dash of color. Since mom was with us, we got a few fun photos taken together as well. I'm so happy we've grown close as friends and roommates. We tend to balance each other out, and we have similar lifestyle habits, which makes living together work great. My soft-spoken nature has helped in situations where her more fiery side could've blown things up, and her strong stance in handling life has helped me grow a stronger spine. Hope you like this Roommate Remix post! What do you think? Is this something you'd like to see more of? You both look so pretty, loved this post! That's so sweet of you to style her! Can't wait to see more of these in the future :) As to the clothes, I love the yellow dress on her, specially with the pink belt. So jealous of your houndstooth skirt, I bought one last year but had to return it cause it didn't fit :( Love the pop of color with your booties! A fun idea for a series. I haven't seen something like this before. Fabulous new feature Linda! She is too cute. Love her dress and earrings. Love your boots Linda and that houndstooth skirt. What a fun idea! She looks super pretty (love her freckles) and I love how you styled her! What a cute dress. And you look fab as always! Loving the lace and houndstooth mix! Cute feature idea. You both look great and I love the pop of color in your looks! This is a fabulous idea darling, yes please make this a regular posting occurrence! You guys are adorable :) What a fun idea for posts. Love the yellow on her and her freckles! 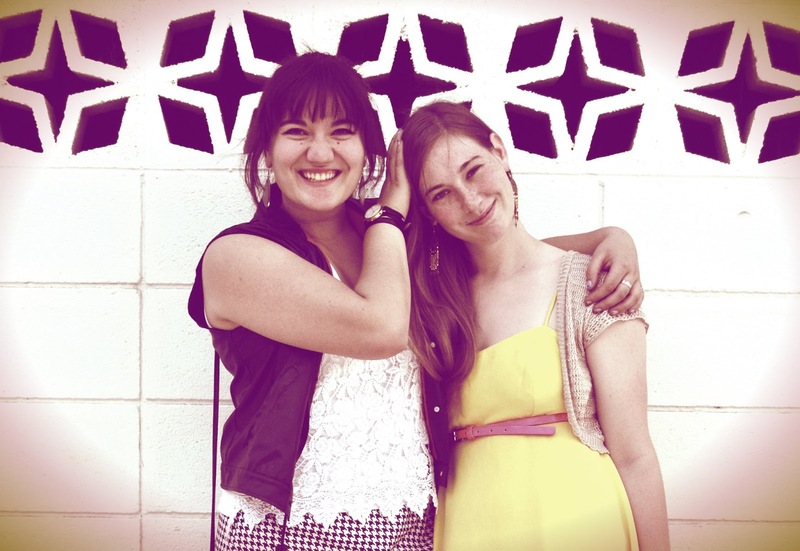 Isn't it so fun taking pictures with your roomie?! My roommate and I have done that for almost a year - I love it! I'm really going to miss it when we graduate! You gals both look great! Corina looks great in yellow! And your blue boots are amazing! You two look stunning and I love this feature! Such a fun idea! I love her sunny yellow dress and pretty pink belt! Oh and her hair?! Seriously?? Shampoo commercial hair much? I love your black and white ensemble paired with the cobalt booties. I will be wearing houndstooth on my blog tomorrow...great minds think alike huh?? I am so excited to see more of you two in this feature and see what you come up with next! Yay! Wonderful job with the styling and photography, dear. You are such a talent in so many things. Know you are busy around now but, should you get the chance, there have a been a couple posts on my blog you might like, especially the church one. Cheap, sad plug time over, now to finish up by saying again...too much...oh well...you are SO amazingly beautiful! Looking fabulous girls! This is my favourite outfit of yours.... Love your idea, so much fun !! amazing new blog segment Linda! this is a very good idea :) i LOVE how you styled her! it really justifies her personality :) and LOVE also ur outfit dear! the combination of the vest and the lace top surprisingly worked! top off with the skirt!! Chic!! Its so great to see Corina being featured here! Love her sunny yellow dress, looks beautiful. I have my eye on your chic houndstooth skirt, love that print! my favourite pieces from this post are Corina's sunny yellow dress and your houndstooth skirt, cool watch and lacy top. 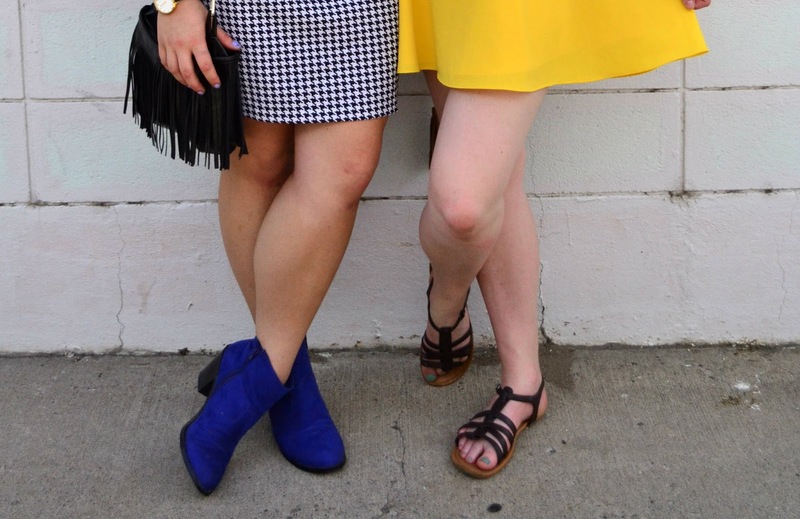 I simply adore the yellow dress and your blue boots! You gals look BEAUTIFUL! 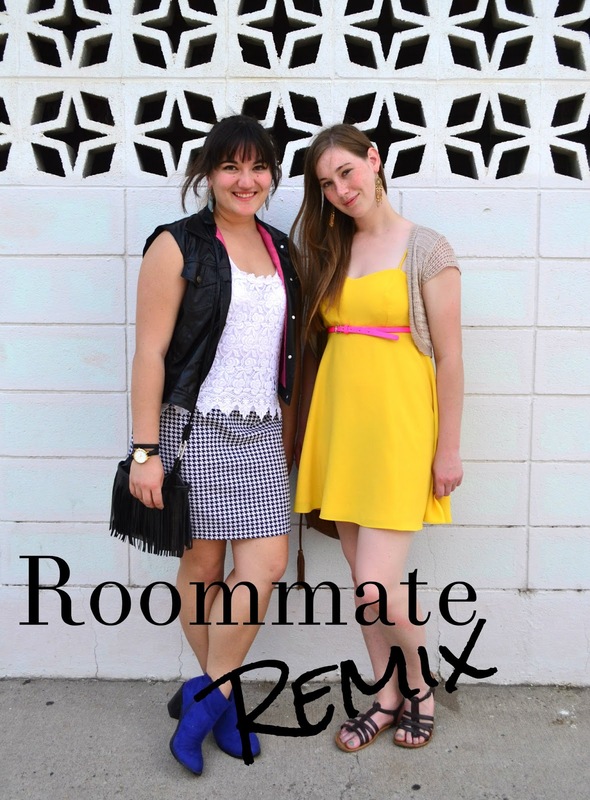 Love the roommate remix idea, I really wish I had had a blog while in college because this would have been so much fun to do! I love this new feature- it's so sweet that you styled her outfit for her! I love figuring out looks for my close friends and boyfriend, it's just so fun! You both look adorable. I especially love your blue booties!! How adorable! You and your girl look fantastic, and I love that houndstooth skirt with your booties for that dark pop of color. Also, cat eye liner really suits you! Love the yellow dress on your roommate. It works so well on her and the pink belt is the perfect accessory. Your outfit is pretty amazing too -- that vest is killer! Such a fun feature! Loving the hot pink lining in your jacket...perfect pop of color! I'm glad you guys get along so well, it's such a great feeling to be good friends with the people you live with! oh so fun, to have roomates dress up too:)) love your skirt and your roommate's yellow dress, very pretty!!! I love this idea! And it doesn't hurt that the color scheme of both your outfits match. I like how the looks feel like opposites, showing off your styling range. YES! I LOVE THE ROOMMATE REMIX! Great photography you too! I love the blue booties, the herringbone skirt, the fringe purse, the water photos! Oh I love this idea! You and your roommate are so cute. Both of you look lovely! Love the yellow dress and your checkered skirt. And your blue shoes are amazing! What an adorable idea, I love the outfits on you two (that yellow dress is too cute!)! Can't wait to see more! you girls both look gorgeous! love this post idea linda! I love her yellow dress and your skirt!!! 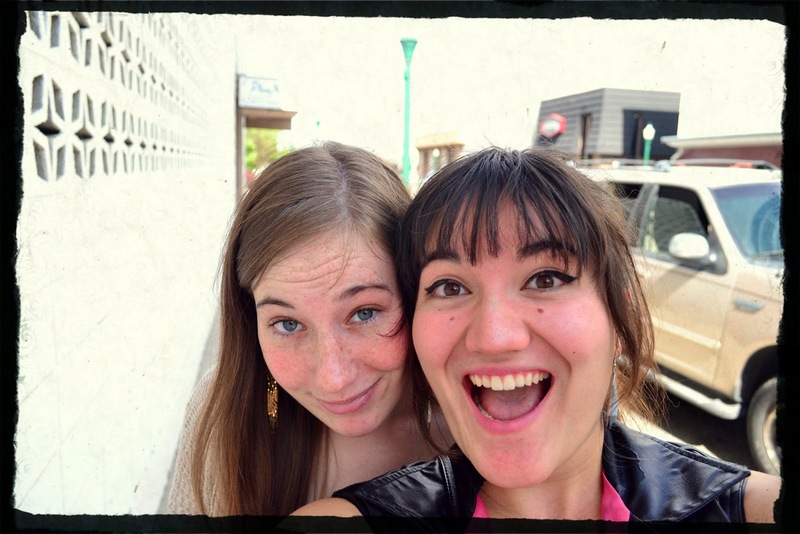 You and your roommate are simply precious! I love her bright yellow dress and your edgy look. The photos by the fountain are just exquisite. I'm so glad you two can balance each other out. That's the best type of friend. I definitely want to see more Roommate Remixes--how creative!